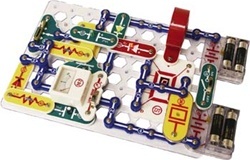 This is a great way to get introduced to the world of electronics! Build over 500 really cool projects such as a digital voice recorder, FM radio, AM radio, burglar alarms, doorbells and much more! An all-in-one Pro Version that contains over 75 parts, including voice recording IC, FM radio module, analog meter, transformer, relay, and 7-segment LED display. No tools needed...no soldering required. All parts are mounted on plastic modules and snap together with ease! 3 full-color, step-by-step instruction manuals which include experiments 1-101, projects 102-305 and projects 306-511.